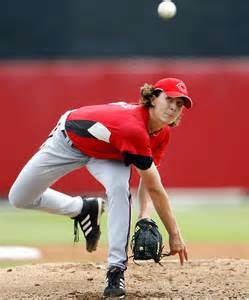 Pitching Tip ---There is no sure fire way of knowing when a baseball player's' arm troubles actually begin, but I often, believe it can be traced back to improperly getting a ball players' arms in shape before the season begins. As a rule kids do very little throwing before their first days of practice and/or are allowed to throw full speed right out of the starting gate. It's the player's responsibility to take care of himself and should be getting the preseason conditioning of their throwing arms, before getting their baseball swings ready. Most young players concern themselves with getting their batting swings ready for the season, constantly in the batting cage, but do not adequately do the same for their throwing arms. This can result in a costly mistake as failure to prepare the throwing arm adequately for the season often leads to loss of playing time, due to injury. Adults who allow kids to start the season without proper arm conditioning are to blame for the situation, and the negative results, arm injuries, may not show up until sometime in some future time. 1. Start shoulder rotation exercises and throwing motion actions without a ball one week before throwing. 2. If at all possible, begin throwing at least 2 to 3 weeks prior to the first day of tryouts or team practice. 3. Begin throwing at a distance no greater than the distance between the base paths, 60' to 90', for that age player and at no more than 60 to 75 percent speed for about 35 throws maximum. 4. Throw at least 2 times per week but no more than 3 times per week for the first 3 weeks. This is especially important to older players. 5. Increase the throwing distance (up to 10 feet), and increase speeds by 5 to 10% while adding up to 10 additional throws with each subsequent week of throwing. 6. DO Not "cut loose" with 100% arm speed for at LEAST the first six throwing sessions. 7. Have rest day(s) at least one, between throwing sessions. 8. Age appropriate arm strengthening exercises are encouraged after throwing sessions or on non-throwing days. There are numerous sections pertaining to this on the site. Small adjustments to this schedule, depending on how a player's arm are feeling, may be necessary if any developing arm soreness beyond normal tiredness, develops as it could be a sign of overuse.If soreness appears, the player should stop throwing until the soreness stops. Pitchers should begin their throwing sessions a little sooner, perhaps a week or two max, than position players begin throwing. Pitchers also should not be throwing 100% speeds more than once a week, before games are to begin. Most arm injuries occur with maximum (Full) speed throwing, but throwing at 15% to 20% less than maximum speeds decrease the chances for arm injuries. 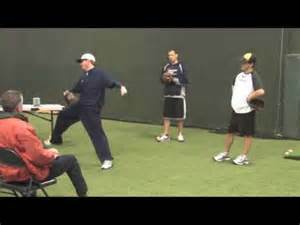 Off season pitching practice is OK when players are limited to throwing about 80% maximum. Beware: Failure to observe these two points often leads to arm muscle deterioration and overuse arm injuries.